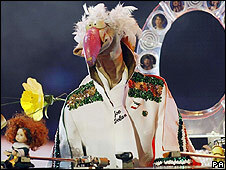 Dustin the Turkey, Ireland's puppet entry for the Eurovision Song Contest, has been raising laughs on Irish children's TV for the last 18 years. But has he got what it takes to sweep this year's contest? They say never to appear with children or animals. And I have to interview a turkey puppet. The latest Irish entrant is, well, unusual to say the least. As are the lyrics, which contain a reference to, I kid you not, "Terry Wogan's wig". He once ran in an election in the Irish Republic, representing the Fianna Fowl party - the main party being Fianna Fail. But for this particular escapade, he sits in a supermarket shopping trolley for his performance, on the front of which are rolling lights which spell out the title of the song. Dustin is adamant that his number, called Irelande Douze Pointe (pronounced in the worst French accent you are ever likely to hear), will win through. "This isn't even a song - it's an anthem. It's a hymn," he says. "It's uniting Europe. It's bringing children from war-torn countries and people from Bulgaria, Georgia, and Roscommon (a county in Ireland) together. "It's getting everyone dancing and rejoicing in the street. I'm telling you, the deaf will see and the blind will hear when this song goes worldwide." The song's lyrics also include a dig at allegations of "bloc voting, shock voting" adding: "Eastern Europe we love you, Do you like Irish stew? Or goulash as it is to you?" The turkey's aim for Eurovision is a straightforward one. Ireland has won the Eurovision Song Contest more times that any other country - seven wins in all. But in 2007 it came last with just five points. 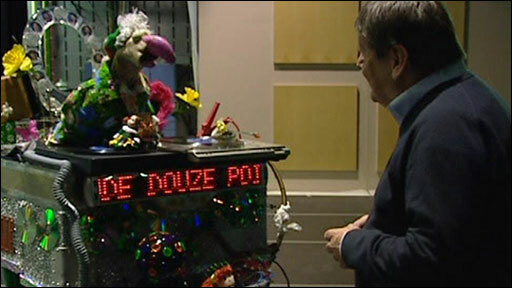 "My message is simple - it's Ireland douze pointe," he explains. "I was looking that up in my French dictionary and it either means 'how far is the nearest airport from here?' or 'give us 12 points to Ireland'. Go on - give us 12 points you good thing. "The bookies have me in as favourite. But all I want to do is go over there and share my love and share my beautiful voice with all these nations of Europe. "I want to reach out my wings and say we're all one, we're all friends. Well, besides the Poles - I don't really like them." As turkeys go, he seems to have nothing personal against the esteemed Mr Wogan, and he told me all he wants to do is bring his love and his beautiful voice to the people of Europe, and tell them that we're all one. At which emotional point I stroked the back of his head and told him not to be upset. He said, and I quote: "It's all right. Would ya ever moind takin' yer hands aff me boss?" Dustin will either get absolutely "nul points", or win the thing. You heard it here first. Ireland will take part in the first Eurovision Song Contest semi-final on Tuesday night, which will be screened on BBC Three at 2000 BST.